BURRR! Its frosty on the farm this morning, but for now the sun has decided to show its face. By this afternoon it will be back to rain showers. I sure do wish Mother Nature would make up her mind, cheer up and stop crying. At least for a few days so we can dry out. After so many days of dark skies this is the first morning this week that we have not had to turn on the generator to charge the battery bank. 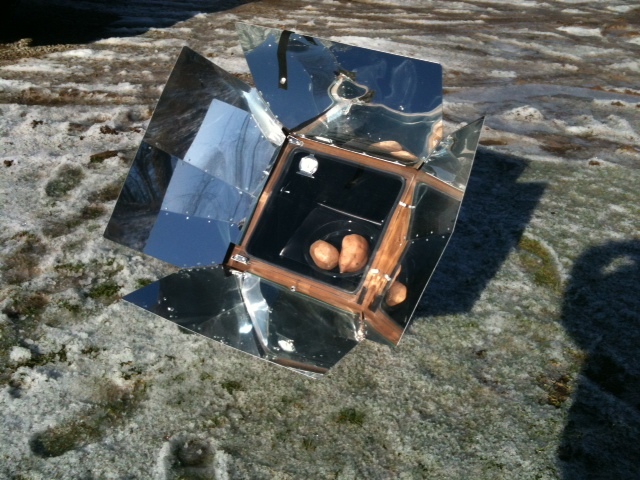 So shine on Sun…shine on those PV arrays and give us a little warmth too to brighten our dark winter moods. 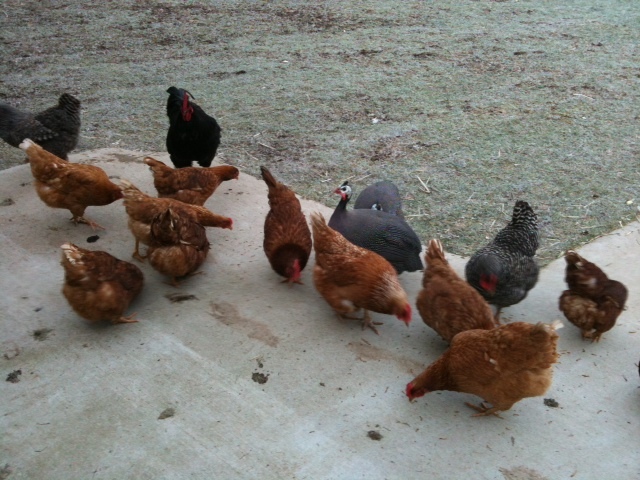 The chickens were ready to get up this morning. 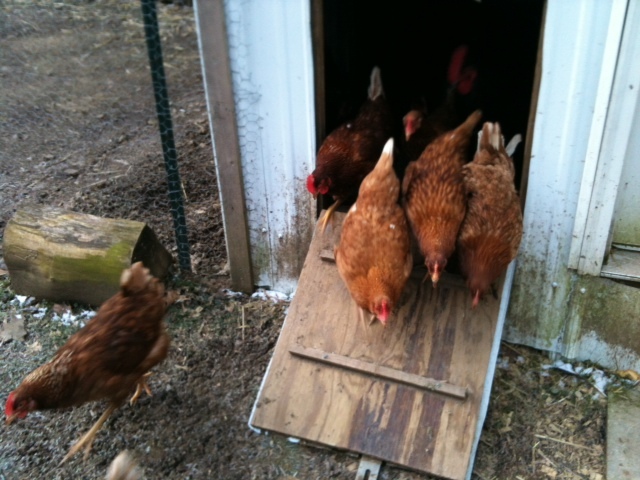 No hesitating to peep out of the coop hatch to see what the weather may be. Like the rest of us they were happy to see sunlight and wasted no time in bursting out of the door. 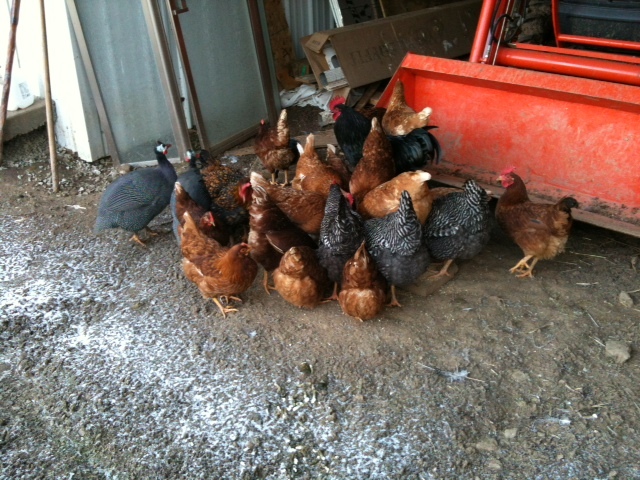 The usual breakfast buffet would be waiting in the pole barn after a quick stop by the garage ramp for a meal worm appetizer. Then it will be off to the bird feeder to clean up any missed seeds that may have dropped to the ground. Its a worm feeding frenzy. Let me in! I'm next, I'm next! Quit Pushing! 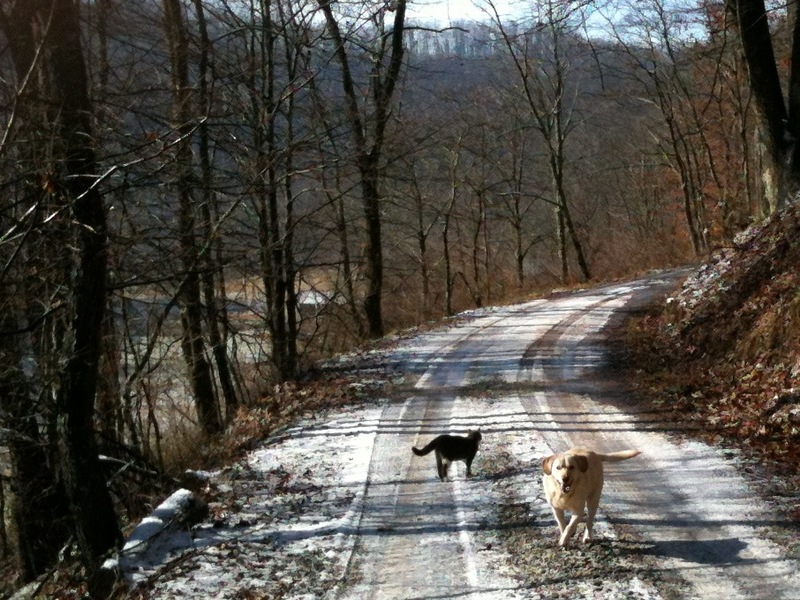 Soak up the sun girls while it still shines, breath in the fresh air and enjoy the freedom of free range on Pot Hole Farm. Produce tasty eggs. Life is good…even for a chicken. 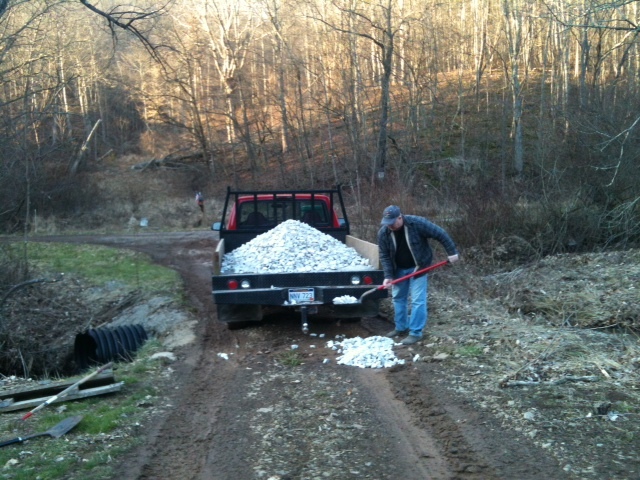 Yesterday afternoon Sonny took the truck down to the quarry to get a load of stone. The stone he bought was about the size of my fist. 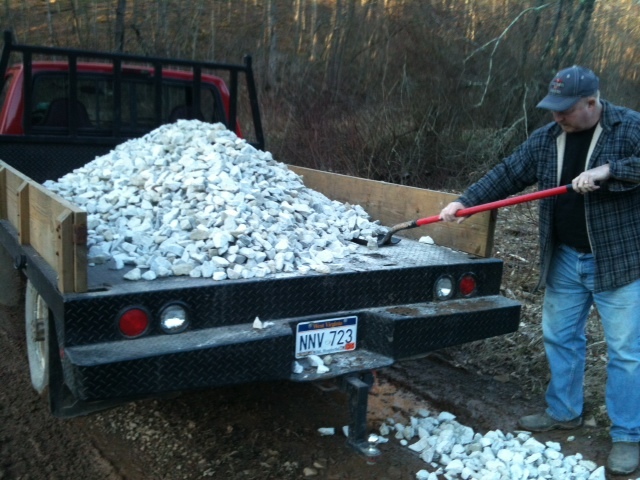 We needed the larger stone to put down in the driveway entrance because the smaller stones get washed away every time we have a heavy downpour of rain. We would like to get enough stone to do the whole driveway at some point, but for right Sonny wanted to try to fill in a couple of the pot holes and muddy ruts. Yesterday was sunny and beautiful, but of course today it is raining again. Hope those stones stay in place. After living off the grid for almost two years now we have figured out that by managing our power we can still use a few luxury appliances. Last week we went to visit Two Lynne’s Farm and Sandy showed me how to make butter from fresh cream. Sonny and I tried to make some a few months back and it just didn’t turn out. I’m not sure what we did wrong. We followed directions from a youtube video on the internet. This person used a quart jar and shook the cream until the whey was separated from the butter fat. Then there were various steps that required squeezing and rinsing. Sandy had a much better method. She used her counter top mixer. The combined turning motion of the bowl and the whipping beaters separated the butter fat and whey in just a few minutes. The butter particles splattered against the sides of the bowl. We drained off the whey and then used a butter paddle to shape the butter and squeeze out more whey. 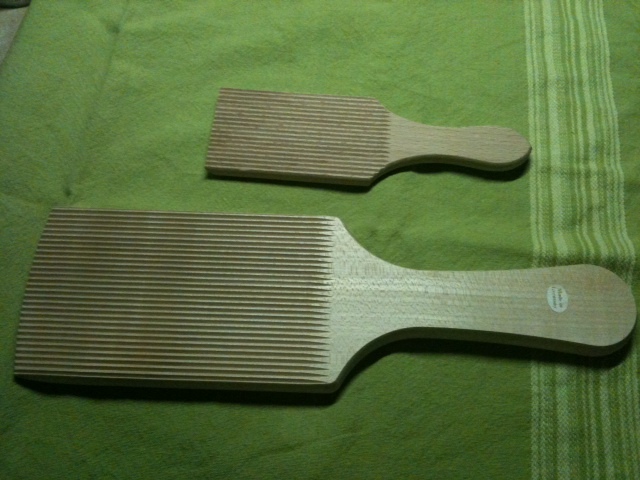 Large and small butter paddles. This time our butter came out perfectly and tasted delicious. 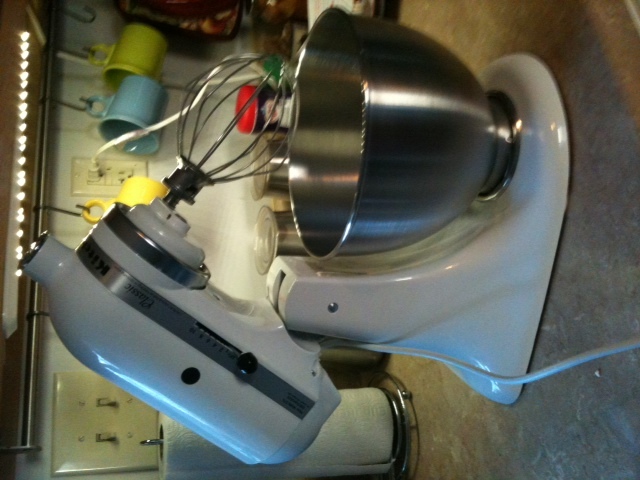 So, today Sonny bought me a Kitchen Maid counter top mixer. It will not only come in handy to make butter, but bread dough and pizza dough as well. It will make these chores a lot easier for me too. Even before we went off the grid I kneaded all dough by hand and whipped up cake batter as well using the old spoon method, but I have been having a lot of problems lately with my hands. Maybe I have worn them out. Any way, I think this mixer will make a big difference. On sunny days the power needed to use the mixer won’t make a dent in the energy stored in the batteries. When the weather is not so nice and the days are cloudy, I can wait for a sunny day or use it while the generator is running. Too many grey days in a row and we have to charge the batteries with the generator. Its all about power management. I enjoy doing things the old fashioned way, but its nice to know that our off grid system can handle the load when I need to step into the present and use modern kitchen appliances. 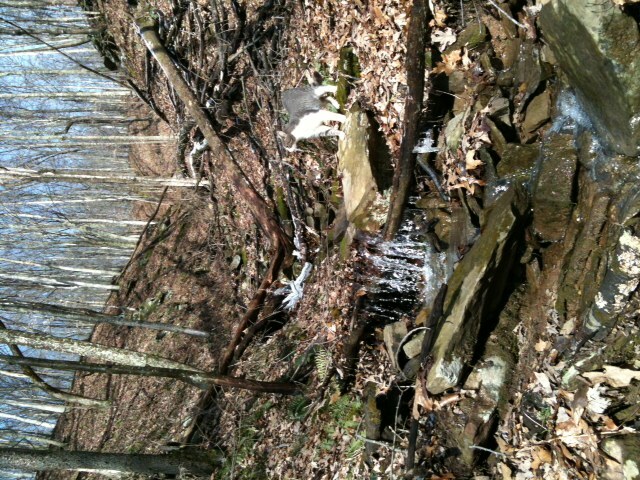 You are currently browsing the Off-Grid in West Virginia blog archives for January, 2012.